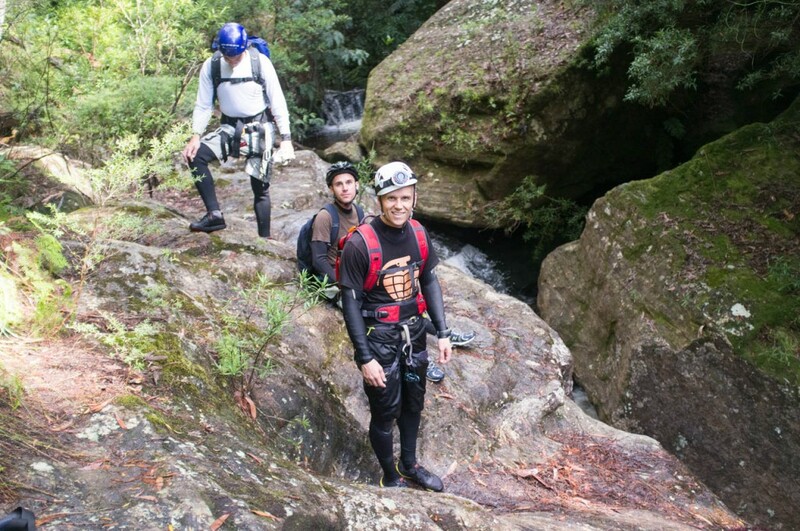 Find out why the Blue Mountains is a canyoning mecca… With a few friends, I jumped into my first ever canyon this year. And now I’m a convert: it’s exciting to have another way to experience and explore Australia’s bush. ‘This is nature’s cathedral,’ Erin said to me as we passed under a natural rock bridge where, high above, a sassafras tree had taken root. We were on our backs, floating downstream through a particularly deep and narrow section of the Bowen Creek North Canyon. It’s a cliché to be sure, but looking up at the mossy sandstone walls that rose above us on either side, I had to agree. The sense of enclosure, silence and sanctity was almost holy. That we were here at all, having this quasi-religious experience was due to my climbing partner Garry. ‘Not really,’ I replied. 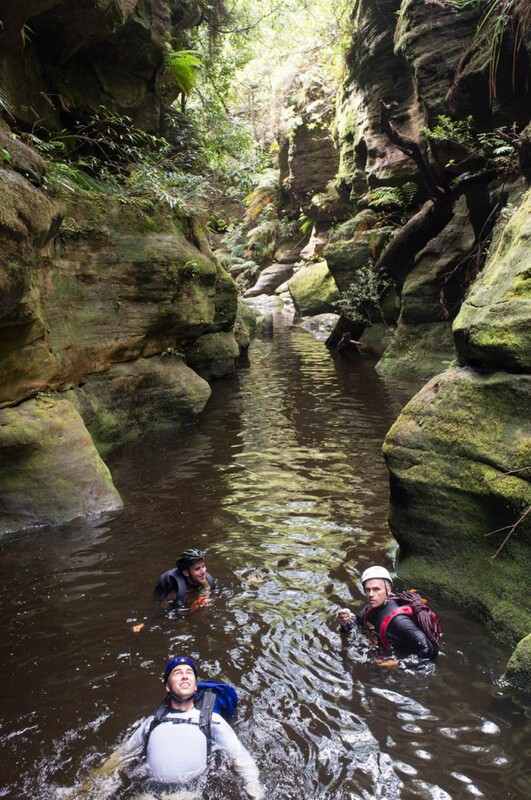 Canyoning had never appealed: I’m not a fan of confined spaces or cold water. Nor abseiling for that matter, even though I’ve done my fair share. But after a few weeks of persistent encouragement, I agreed, on one condition: that he join me on another adventure, a walk-in, climb-out traverse of the Grose Valley. We had a deal (and a story for another day). On a pleasant February morning, we parked just south of Mt Wilson on the north side of the Grose Valley and followed a fire trail down to the canyon’s descent gully. There were four of us: me, Garry and his mates Erin and Risto. 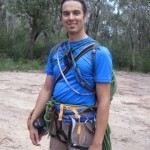 Risto was a novice to both canyoning and abseiling while Erin hadn’t been since uni days. At my suggestion, Risto had gone with Garry for a couple of practice abseils. 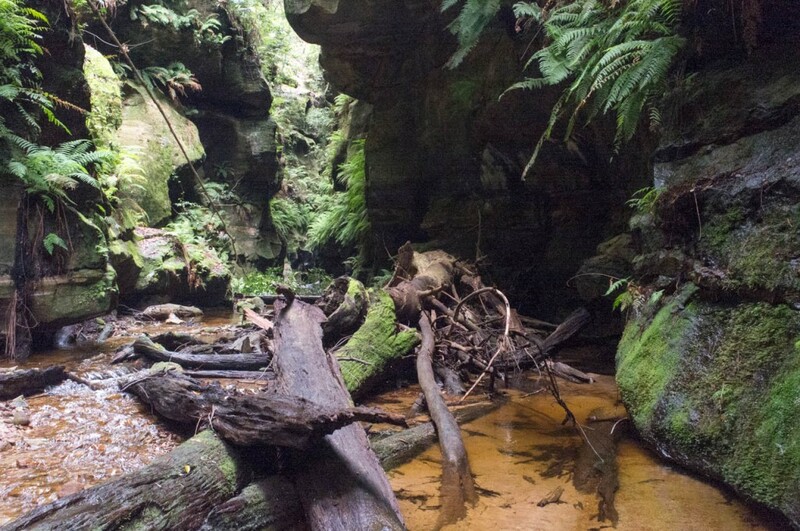 Our original destination had been the more challenging (and remote) Whungee-Wheengee Canyon, which feeds the Wollangambe River further north. However, recent heavy rains and the threat of a February thunderstorm had made Bowen Creek the safer, smarter choice. The descent to the canyon was a slippery and tentative affair. Once we had left the fire trail, the terrain was steep and muddy. Despite taking a decent stack when the mud gave way, I still found the approach to be a worthy walk in its own right. 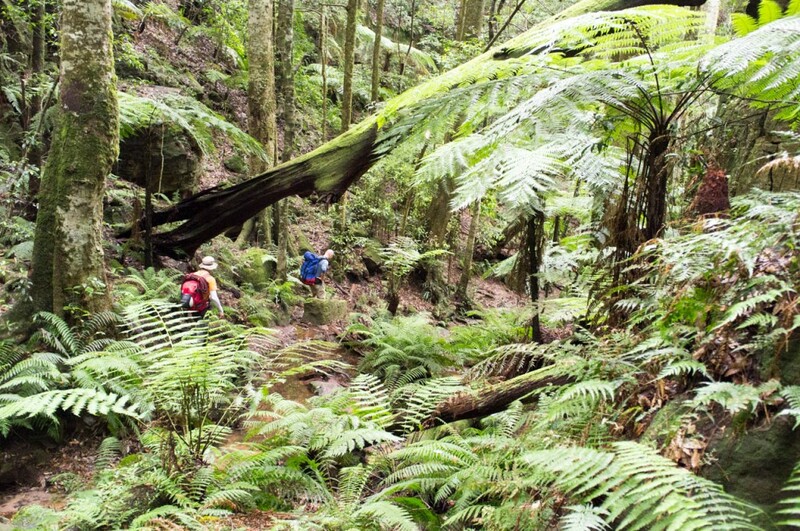 This landscape of temperate rainforest trees, where coach wood (Ceratopalum apetalum) and three- to four- metre tree ferns (Cyathea cooperi) stood tall, would be completely invisible to day walkers on the track above. 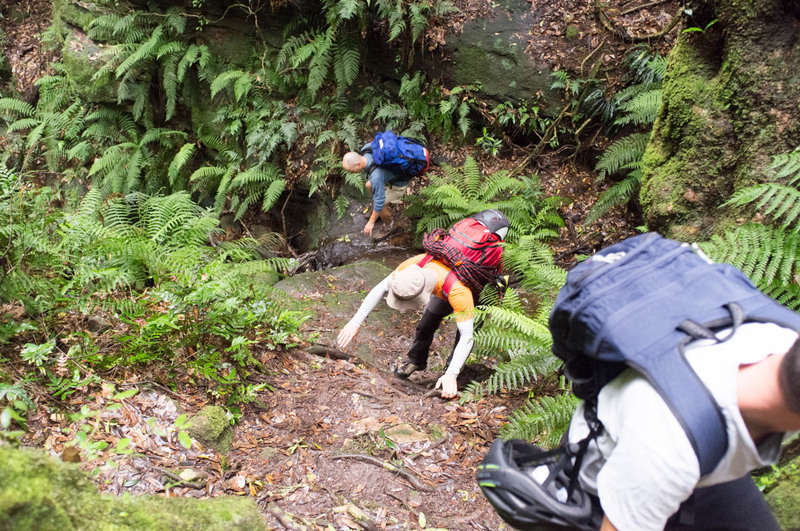 We followed a rainforest gully dominate by massive tree ferns all the way down to the canyon. Eventually I stopped trying to walk around the creek and started wading. A large group of canyoners joined us at the top of the canyon as we were slipping into our wetsuits. They comprised at least three generations of two families.Wanting some solitude, we let them get a head start. 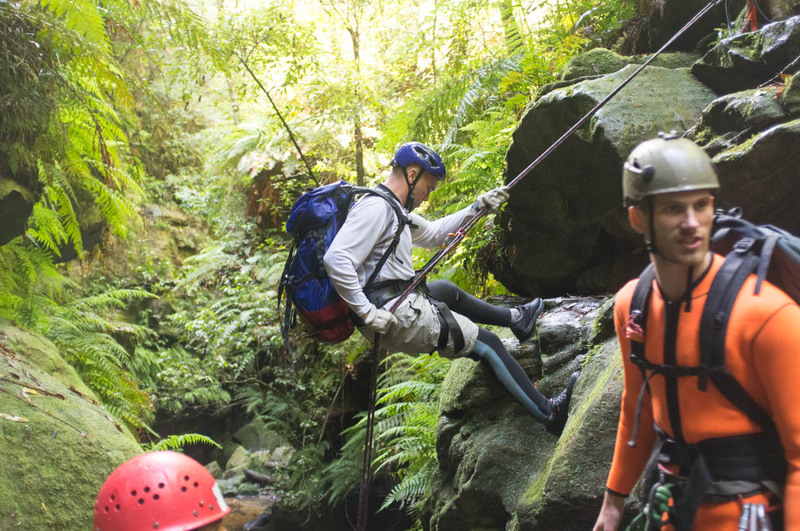 As one of the patriarchs – sporting a faded, red helmet and beaten-up canvas rucksack – prepared for the first abseil, I noted his lack of abseil device. 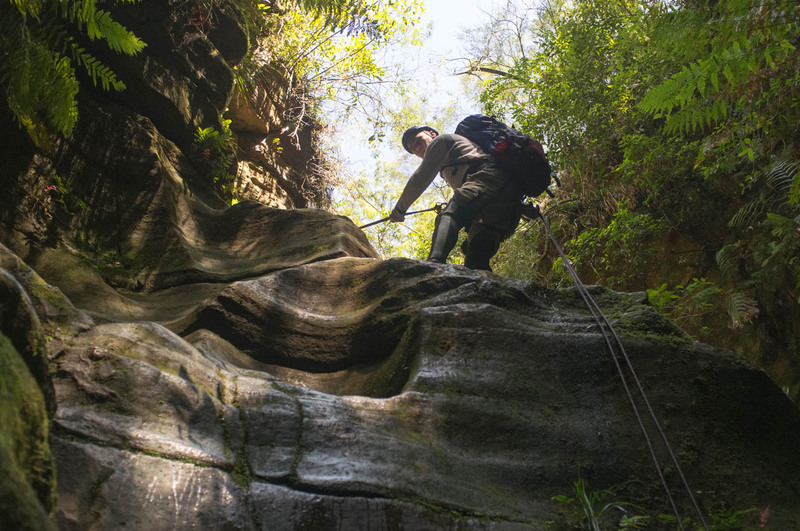 Instead, he had rigged up a carabiner cross-loaded with a well-used piton to control his descent. This was a technique from a time when sports climbing and camming devices were still a distant dream. ‘Abseil devices are for sissies, hey?’ I joked. 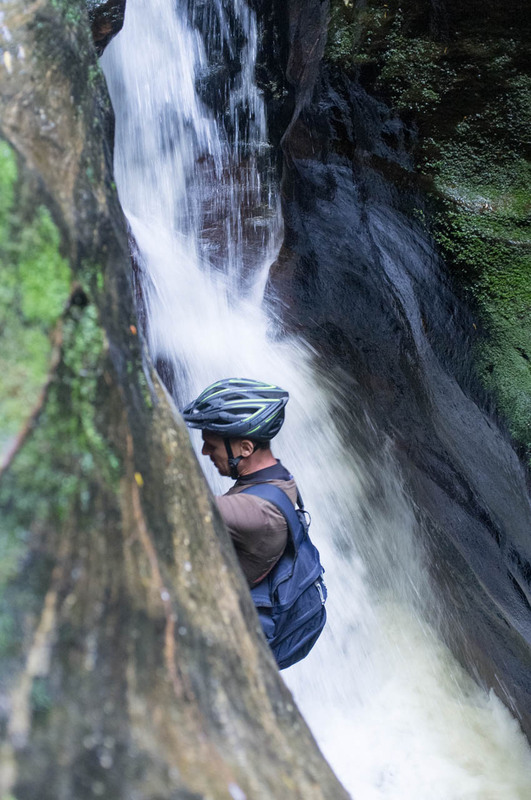 ‘I’m guessing you’ve been canyoning before,’ I remarked. ‘You could say that,’ he said, lowering himself over the edge and into his umpteenth canyon. I quietly hoped to emulate him one day, sharing, as he was, these unique experiences of the wild with his children and grandchildren. That said, I was also quite happy with my bombproof and purpose-made abseil device. As the most experienced abseilers, Garry and I had agreed to top and tail the three abseils for the day, with Erin and Risto going in between. After looping our rope through the fixed anchors (all the abseils have time-saving, fixed anchors) Garry descended, followed, somewhat gingerly by Erin and Risto. At last my turn came. I landed on a ledge just above a deep pool, enclosed by mossy 20-metres cliff. The others were already in the water below. Any doubts I had to begin with were gone by now: this was going to be an amazing day in a place that was still relatively untouched – there are just not that many people who have the know-how, equipment or motivation to access a cold, winding canyon like this. I snapped a photo of everyone – a frame that will be forever etched in my mind – before scrambling down some into the cold, dark water. I was keen to spend as little time as possible in the deep water; I had only brought a short-sleeved spring suit. The others all wore full-length steamers. While the shock of entering the water was not as severe as feared, I could still feel the icy water’s acute rasp on my exposed limbs. This was a place where hypothermia would be fast and merciless if conditions changed or injury caught you unprepared. Fortunately, the day’s swims were quite short – maybe 30 or 40 metres at most. According to the track notes, they could also be avoided with some careful route finding. But it struck me that it was precisely the sensation of the current carrying you downstream beneath these cliffs and distant, sun-speckled trees that gave the canyon its aura, as though some greater force was gently pushing you towards whatever awaited at the end. In between swims and abseils, we scrambled across large boulders and rocky sections where we would empty water from our packs. In the process, I discovered a new use for my pack’s sleeping-bag compartment: drainage. While I simply unzipped the compartment, others had to contort this way and that. 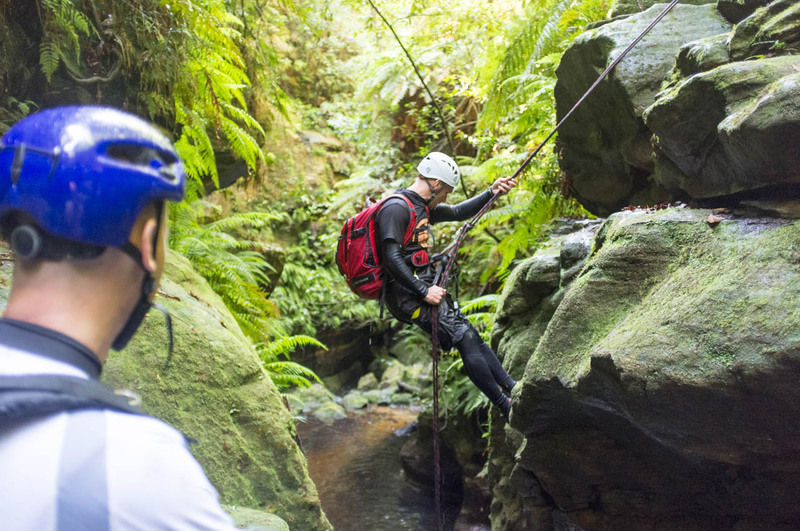 We didn’t encounter the first group again, and enjoyed an immense silence for the most part, though a small commercial tour group caught up with us at the third and final abseil for the day. When I say that the canyon was ‘relatively untouched’ I mean that those who have visited here would number only in their thousands. 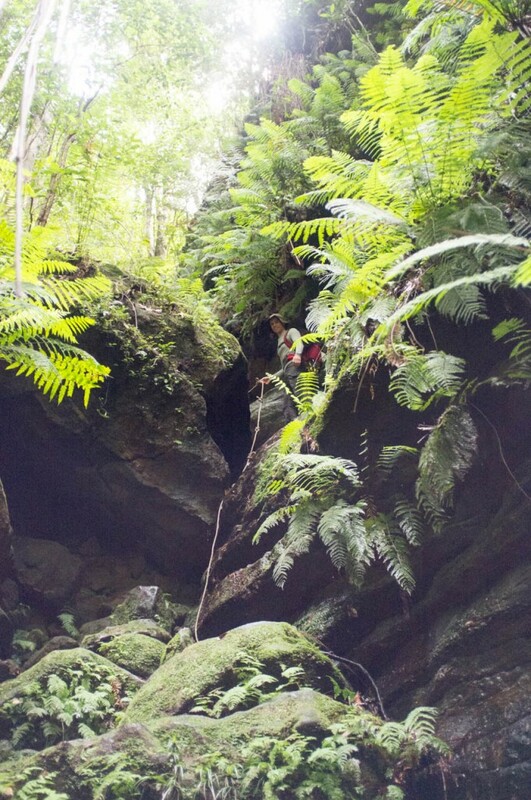 One thing we did learn from the group was that you can abseil down the final waterfall, squeezing through a hole eroded over many millennia. The brave and foolhardy, including one of the guides, can also jump off the slippery ledge into the deep pool 10 metres below. ‘We’re doing this again, lads’ beamed Garry in his typical Yorkshire accent as we ate lunch and warmed ourselves in the sun. Soon we were wading down the final section of Bowen Creek North, where it joins with its southern branch. Now that we had stopped moving I noticed how quickly my core temperature dropped too. I was shivering by the time we finally changed on a sandy beach and started the steep ascent back to the fire trail. Hauling myself up the hillside in dripping wet shoes, I knew two things: first, Garry would keep his promise and traverse and climb the Grose Valley with me later in the year; second, I would be back again to help him with the unfinished business of Whungee Wheengee Canyon. The whole canynon took our group of 4 about 7 or 8 hours (including the walk in and walk out, and a brief stop for lunch). A smaller/more experienced party could move much quicker.